CAIRO Islamists are seeking to enshrine in Egypt's long-awaited new constitution a number of articles that secularists and liberals fear would bring theocratic rule and severely set back civil liberties, including provisions that could empower clerics to review laws and would stipulate that women's rights cannot violate Shariah law or "family duties." Liberals and secularists have been struggling to keep out the provisions, but are finding themselves outnumbered and vulnerable to being overruled on the 100-member assembly that is writing the charter meant to set the path for post-revolution Egypt. The assembly, where Islamists hold a majority, has been debating the constitution over nearly 50 sessions during the past months. But the wrangling has heated up as the body gets closer to voting on a final draft, which would then be put to a yes-or-no referendum by the public, expected by the end of the year. Liberals, however, say they have few tools to block Islamists' demands other than walking out of the assembly  a step they have wavered on taking for fear or losing their voice entirely. President Morsi: Egypt and U.S. "not enemies"
Morsi: Protecting U.S. Embassy "Egypt's duty"
Around 100 women protested against the Islamists' provisions Tuesday outside the upper house of parliament, where the assembly has been holding its sessions. They chanted against a "religious state" and shouted, "Down with the rule of the Brotherhood." Magda Adly, one rights activist at the gathering, warned of "a constitution that only sees women as tasked to make babies," saying the Islamists' provisions would open the door to dramatically lowering the marriage age for women and ending restrictions on female genital mutilation. "It's a disaster what's about to happen to the Egyptian constitiution," Rasha Abdullah, another woman protesting the Islamic law clause on Tuesday night, told CBS News. She called the assembly crafting the constitution "a committee with a majority of Islamists with mentalities that go back 200 years... they don't represent any of the women or the men assembled here today." Battles also spilled into the courtroom Tuesday as a Cairo court convened to examine nearly 40 suits calling for the assembly to be disbanded. Lawyers from the two sides pushed and shoved each other in shouting matches that forced the judges to postpone the hearing for a week. If the court eventually orders the assembly disbanded, Islamist President Mohammed Morsi would form the new one, and liberals' have little faith it would be any more favorable to them. The constitution has been long awaited as a key step in establishing a democracy in Egypt after last year's ouster of autocratic ruler Hosni Mubarak. 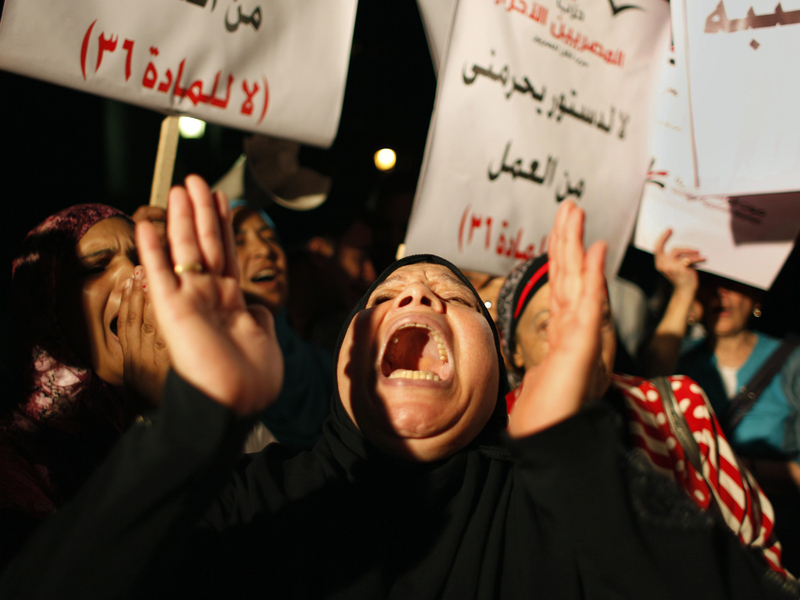 The uprising that forced Mubarak out was led by progressive, secular activists who rallied public anger over worsening poverty, the monopoly on power by Mubarak's ruling party, rampant corruption and widespread abuses by security and intelligence agencies. But in the nearly 20 months since, Islamists have emerged as the strongest political power. Morsi, Egypt's first freely elected president, is a veteran figure from the Muslim Brotherhood, which dominated parliamentary elections last year. Also powerful are the ultraconservative Salafists, who call for an even stricter implementation of Islamic shariah law than the Brotherhood. The Brotherhood and the main Salafist political party hold at least 52 seats on the constitutional assembly, which was formed by parliament before a court dissolved the legislature. Their majority is further strengthened by Islamists unaligned with parties. The assembly includes eight women, several of them Brotherhood members, and eight Christians. So far, no articles have been finalized, with negotiations still going on within the assembly. The assembly chief says he now expects a final draft to be ready in November, though the timetable has been pushed back repeatedly in past months. The Brotherhood in particular seems to be hoping to reach enough of a consensus within the assembly that it can tout the document as having broad backing. But with liberal, leftist and secular movements weakened and with little pressure from the public, the Islamists appear confident they can get much of what they seek in a final draft and win approval in a referendum. "There is a strong sentiment in the street for implementing shariah," said Sheik Khaled al-Azhari, a Salafist who sits in the assembly. "Add to that, there is a big difference between talking to people from an air-conditioned office like liberals and between living their lives and knowing their pains." Al-Azhari, who is also a TV star on a religious channel, said Islamists had one main rule guiding their hand in the constitution: "You can't criminalize what is permitted by shariah law." Some parts of the new charter that appear to have consensus so far would set a more democratic system for Egypt, reducing the overwhelming powers that the president has long held and increasing the authorities of parliament. But a number of articles put forward by Islamists have raised liberals' concerns. One proposal would establish a powerful political role for Egypt's premier Islamic institution, Al-Azhar, saying the opinion of its top clerics would be "the final or main reference for the state in whatever is related to Shariah law." Some fear that would establish an Iranian-style system where clerics oversee laws passed by parliament. Al-Azhar is generally seen as a moderate body, but conservatives and Salafis have been gaining influence in its ranks. "Islamists will continue to rule the country through this institution (Al-Azhar) even if they lose elections," the National Front For Justice and Democracy, an independent group monitoring the assembly's deliberations, said in a recent report. There has been a sharp debate over revising the second article of the previous constitution which says the "principles of Shariah" are the main source of legislation. Many Islamists see that language as too vague and want it changed to "the rulings of Shariah," which they see as providing for a more strict adherence to their interpretation of Islamic law. In other Islamist-backed articles, women would enjoy equal rights as men as long as they do not "violate Shariah" or "family duties." Islamists also blocked attempts to introduce a clause guaranteeing Egypt's adherence to international treaties it has already joined on ending discrimination against women. They worried that such a clause could be used to ban female genital mutilation or prevent lowering of the marriage age, which they saw are allowed under Shariah. Some Salafi sheiks have called for allowing girls to be married with the onset of puberty. Another proposed clause would stipulate that Christians and Jews have the right to abide by their "own religious laws" and choose "their religious leadership," a provision that Islamists say protects minorities. Critics say it contradicts the principles of equal citizenship and enshrines a second-class status. Another article would recognize the right of Christians and Jews to conduct their rituals and build places of worship, but on the condition they do not "violate public order." That could allow lawmakers to maintain restrictions on the building of churches, since church construction has often prompted sectarian strife in the past. Other clauses are heavy with vague references to preserving the "morals" and "traditions" of Egyptian society, which critics fear could be used to restrict freedoms of speech and political activity. "This is a disaster," said leftist politician Hussein Abdel-Razek. "The proposed articles reflect the core of political Islam currents like the Muslim Brotherhood and Salafis. They are autocratic and repressive at heart." Nehad Aboul-Qomsan, head of the Egyptian Center for Women rights, raised a warning over the rights women won over the years, saying, "We are losing them now." Manal el-Tibi, a female activist who was in the assembly, resigned last week in protest over the articles concerning women. "It has become clear that the constitution is being prepared to emphasis the religious state for a certain group to monopolize power," she wrote in her resignation letter. El-Tibi is a member of Egypt's Nubian ethnic minority and clashed repeatedly with the assembly over her attempts to include protections against racial discrimination. Other members opposed, insisting Egypt does not have multiple races, and a Muslim Brotherhood member Omar Abdel-Hadi accused el-Tibi of having separatist aspirations and seeking foreign intervention in Egypt, a typical accusation leveled by Islamists and pan-Arabists against their rivals. The assembly has been plagued with troubles from the start. A first version of the assembly was dominated even more heavily by Islamists, prompting a mass walkout by liberals. That assembly was dissolved by a court that ruled parliament had not followed proper standards in forming it. The parliament then formed the new panel. "A single political faction has monopolized the constitution writing, while the rest of Egypt was excluded from the process," the National Front for Justice and Democracy said.